NEW YORK (WABC) -- Monday marks the end of the line for the large information board at Penn Station. Amtrak has deployed smaller information screens around its waiting and ticket area, so the big screen with its outdated technology is being demolished. 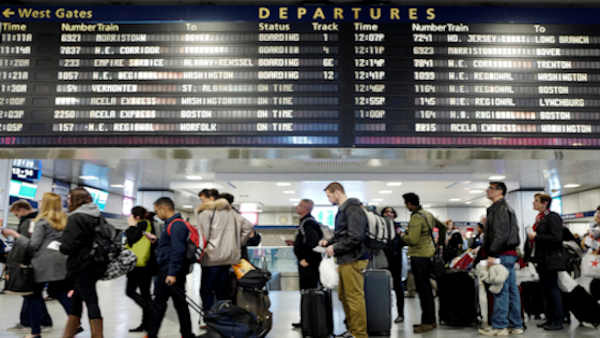 Removal of the board marks the completion of a project to install a new, state-of-the-art Passenger Information Display System at the nation's busiest transit hub, Amtrak said. The new PIDS, which was activated in October 2016, communicates train status, origin and destination stations, boarding gate and other information and features bright, new LCD displays which are easier to read and synchronize audio and visual messaging in the station. Amtrak said there are large video screens at either end of the concourse featuring train status information, aimed at drawing riders away from the center of the room to ease congestion. The removal of the board will be done in phases throughout the week, including overnight hours to lessen the impact on normal station operations.